I'm sure the list will grow, but I'm excited to start learning. Questions: The front left hub cap has been welded on, any ideas why? Are these chips in the window repairable, because I'm sure getting glass for it will be a pain? Welcome to the forum! And congrats on your new LUV! The hub has more than likely been welded on because the bolts that hold them on are fairly difficult to get off and once you strip the head trying to get them off, replacement hardware is difficult to find. The windshield is not a hard thing to find. 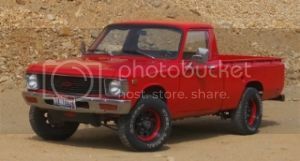 Head over to rockauto.com and they will have what you need. However, side glass will have to come from a part-out in the classifieds page. Good luck with your LUV! Hannah - '79 4WD, 32/36 Weber, and a Pacesetter header.